Incoloy 825 is designated as UNS N08825 and Werkstoff Number 2.4858. 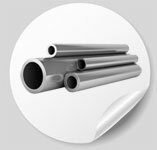 Alloy 825 also known as Incoloy 825, Inconel 825 & Nickel Alloy Pipe. It is similar to alloy 800 but has improved resistance to aqueous corrosion. Incoloy 825 is classed as a ‘C’ alloy, and is reasonably easy to machine. Incoloy 825 is readily weldable by the normal processes (GMAW (MIG), GTAW (TIG), SMAW (manual), SAW).